This week’s roundup consists of our most recent blog posts. Read on for news in the EHS world from our previous industry roundup, learn how to improve quality with mobile event tracking, get 4 questions to ask before buying a compliance management system and more. This week’s blog roundup focuses on two industries, Life Sciences and Food and Beverage. This roundup offers readers the chance to truly understand tools such as the Risk Matrix and discusses mergers and acquisitions in the Life Sciences industry and more. It covers ways to strengthen relationships with contract manufacturers and big data in the food industry. We close with an infographic on how to pay more attention to food waste in your supply chain. This week’s EtQ roundup will consist of all of our April blogs so far. We have topics surrounding risk, social crisis management, reducing incidents and more. Enjoy! This week’s roundup consists of March blog posts you may not have had the chance to read. So, for your convenience we have rounded them all up in one place! Read more for posts regarding food safety, training mistakes, quality management Jedis and how automated software helps in achieving your goals. This week’s roundup is a compilation of all March blog posts. Read on for topics regarding five ways the Quality Management System (QMS) reduces the cost of quality, big data in the life science industry, four tips for preventing ergonomic and repetitive use injuries in the workplace and much more. Miss anything on the blog this month? We’ve compiled posts from the month of February so you can catch up here. Learn how to get the most out of your compliance management system, 3 essential qualities of effective contract manufacturing relationships and more. This month’s blog roundup will look back on some of our posts related to the Life Science industry. Some topics we compiled this week include how to tell if your company is—or isn’t—leveraging the full power of Lean, four advantages of integrating eMDR with your Compliance Management System, cybersecurity in the medical device industry and more. Read on to catch up. This month, our roundup consists of previous blog posts related to Environmental Health and Safety (EHS). So, if you have not gotten the chance to read up on how risk is applied to EHS, the benefits of the cloud on EHS or how to keep your incident rate down...read on! 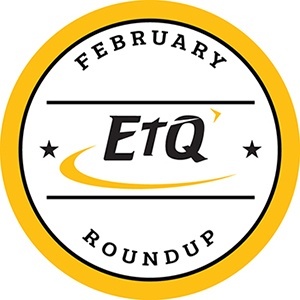 In this month's roundup, we bring you some of our top posts on Quality Management. Some topics we look back on this week include risk management’s impact on the Quality Management System (QMS), why the EQMS is necessary to ensure quality success and how companies today are defining quality. Missed any of these posts the first time around? Read on to catch up. In this roundup, we pull from the EtQ archives to show you the benefits of an integrated Quality and Environmental Health and Safety (QEHS) system. Read on to learn the similarities between Quality and EHS systems in terms of ISO standards, learn about the benefits of combining these initiatives into one system and more.